We have won 5 new clients very recently. Lots more enquiries too. And clients are typically spending more and committing for longer campaigns compared to pre-recession. Is confidence returning? I met a couple of Nat West senior managers last week who asked us to help them with clients that need support with new business development strategy. They told me that they are very much finding that companies are ‘getting on with it’ so to speak. I have put together 5 Tips to help take advantage of the upturn. Companies are beginning to raise their head above the parapet and that has to be positive. At GSA, we are certainly doing that. We have employed a new business development manager. We are redoing our website and literature. We are doing a new mobile site. We have added social media lead generation to our offering and taken our medicine below which has generated several excellent new enquiries and new clients where they have ‘found us on Google’. Below are 5 must-do suggestions to get things going? Networking – Define your target market carefully (to avoid time-wasting) and get out to networking events, exhibitions and other forums where your audience gathers. Mingle and network. Upweight your Content – I know it is time-consuming to write blogs like this and to post content on LinkedIn and Twitter etc. However, it works. It must be part of your inbound marketing and lead generation strategy. Doesn’t matter if you are big or small. We have seen more enquiries as a result. So, define your topics carefully, allocate dedicated time, plan your blogs and articles, post on discussions and get involved. 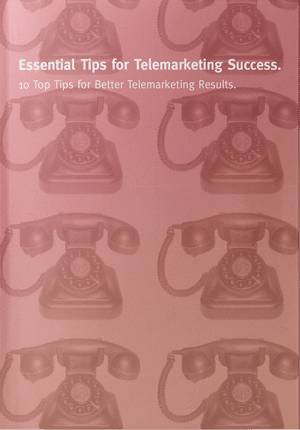 Get on the phone – Okay, I know telemarketing what we do for a business. But it works. On a previous blog I wrote about the amazing appointments we generated for clients in 2011. Have a look at our testimonials. That has continued into 2012. The phone is still a great tool for lead generation if you know your target market and you have something worthwhile to offer. So use it! LinkedIn – Worthy of a separate tip. There are lots of people out there that can help you with LinkedIn. Or you can just DIY. There are all manner of discussions going on and requests for help within your marketplace. Make a point of determining when you will get involved e.g. first thing in the morning for half an hour. Decide which groups are relevant. And post things to your profile. Don’t forget that you can include Twitter at the same time by ticking the box to post to Twitter. Referrals – It may sound obvious but if you’ve done a good job, ask if they know someone else that could benefit from your services. Couple that with a request for a testimonial and you are again building both credibility and content. I sent a request for a testimonial to 60 people on LinkedIn the other day. 12 replied within the day and wrote wonderful testimonials for me. As a special offer to make the most of the upturn for your business, book before 30 April 2012 and receive a 15% discount on our standard price!